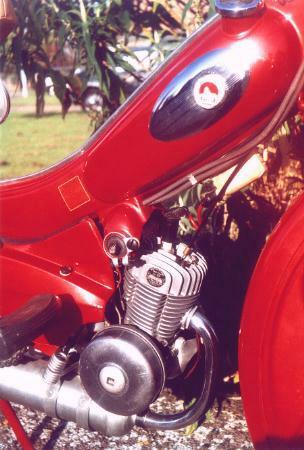 TI Raleigh Group's decision in late 1961 to factor through Motobécane products spelt tragedy for the remaining few British Cycle Corporation companies making their own character little mopeds. The ancient Hercules factory was the first to be swept away, while Phillips and Norman received brief stays of execution (though much in name only) as rumour has it the take-over contracts obliged their brands to be maintained for a further year. The facts in this tale are probably lost in the fog of time, however a range of Norman motor cycles was still listed into the 1962 season, though notably it comprised previously existing models and most likely represented no more than a building out of remaining parts and clearance of stock. After 24 years of motor cycle manufacture at Norman, the last new machines became the Nippy Mk V & Lido Mk II mopeds, while the final models Phillips, since their entry into the moped market in October 1954, comprised the Panda Mk III PM1 & Gadabout Mk IV PM2. These were all in truth, little more than versions of the Motobécane derivative Raleigh RM4 & RM5 in different colours, logos and trim, with Raleigh price-pitched as the prime brand, Norman in the middle, and Phillips in premium spot. 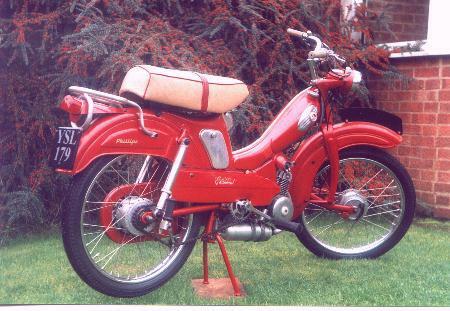 As it transpired, both the Phillips machines looked very smart in their bright red livery, and with the 6% price advantage of £3-17s-1d offered for the Panda Mk III against the Raleigh RM4, this particular model actually sold quite well. Along with the RM5 and Lido Mk II, the Phillips Gadabout Mk IV presented the first introduction of the new Motobécane super moped to British shores, the new French King had arrived. Not only was it solidly built with a substantial pressed steel frame, it had functional suspension at both ends, effective weather proofing, dual seating capacity, standard fitted speedometer and a good range of dedicated accessories. The motor though was the crowning masterpiece, utilising the automatic Dimoby Variator system introduced with the AV78, and marrying it up to the newly developed power plant: the AV89. A 9:1 compression ratio, big ported barrel and 14mm Gurtner carb produced twice the power of previous Moby motors and delivered enough go to make the new model a thoroughly practical all round machine. The crank bearings proved practically unburstable and, with its hard chrome liner, it could capably withstand constant full throttle use as the infinite vario system effectively prevented potential over-revving. Automatic simplicity made it both customer friendly and just about bomb proof; then as conditions became favourable to advantage the high drive ratio, these things could really fly! It was not unknown to get the needle into the 50mph area of the triangular Huret 60mph clock, though the accuracy of this often approximating instrument was always questionable. A true 40-45 was probably a more realistic expectation, though no doubt about it, the AV89 would steadily build-up to maintain constant speeds well beyond the capability of many contemporaries. The model endured over the following two decades of its manufacture because it was a great all-rounder, and developed with telescopic front forks and progressive changes, to its final elegantly styled 70s form with square head and barrel finning, large rectangular headlamp, long seat, and classic Motobécane bronze colour. In a standard fitting of minimal panels behind the badges, the Phillips Mk IV is unique in being the only version not having the unnecessary bulbous chrome tank trims that spoil the graceful line of the natural frame. The early front fork is band-suspended leading-link, blighted for its reputation to 'rear-up' under braking, though more inclined to this tendency as the rubbers become decayed with age. Put in new ones and the effect is much negated (yes I know you can't get them, but cut 5mm off the width of Antig grasstrack bands and they're spot-on, contact Carl Squirrel). UK market touches of the Phillips Mk IV are the chromed trim covering the Moby cap logo, chromed steel turned toolbox cover screws, Phillips' own pedals, John Bull rear footrest rubbers, and Raleigh pattern handlebar furnishings of brake levers, throttle, grips and Miller push button. A Miller horn shyly peeps out from under the front of the seat, and on this example the standard Lucas L590 rear light fittting has been substituted for a Miller type 39 unit. The feature machine's characteristic rack with its rear light and number plate arrangement, stainless spokes and beige seat colour with crimson piping are personal styling diversions of this particular reconstruction from an utterly ruinous wreck, to the splendid machine that stands today. Less obvious (until you ride it!) are gearing up conversion changes of the rear sprocket from 48T to 44T raising the drive ratio by 8%, and a compression ratio increase to 12:1 by massively cutting back the cylinder head face by 1.2mm. Along with the Norman Lido Mk II, The Phillips Gadabout Mk IV was only produced in very limited numbers and listed for the 1962 season; once these were sold off there weren't to be anymore. 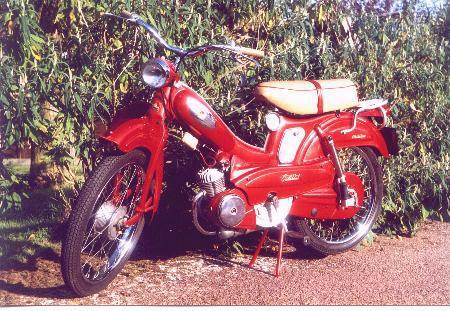 Few examples of these models survive today, so this is one rare and unique moped specifically converted for only one purpose - all out speed! Controls are pretty conventional Twist & Go; so let's see if it does! Turn the throttle forwards for decompress to get the engine spinning, and the trigger choke readily initiates combustion. One would ordinarily expect the raised gearing to make the pull-off somewhat sluggish, but the Vario system seems to compensate most effects, and with the increased compression ratio it's off like a train! 30mph comes up with no effort at all, and you consciously have to ease back to keep the Phillips within urban limits. The undamped suspension feels quite bouncy over bumps but comfortably rides all in its stride, so pilot fatigue over a distance isn't the issue that was so common with many old mopeds. Brakes are bigger and more effective than the basic models, and though smooth cornering is confident with the firm frame, it will tend to wallow away on the suspension if the bend gets bumpy. The call of open countryside beyond the edge of town is answered by the motor as the speed relentlessly builds between 45-50 on the clock, and that's still sitting up! The pace can be maintained provided wind or incline do not become adverse, then as conditions become favourable there's even more to come. Tailwind and it's over 50, downhill over 55, tuck down and the needle's pinned to the stop! (Though do make allowance for that optimistic speedo.) The motor feels confident in free revving since it runs so smoothly, however it's probably just as well that the situation returns to normality as the bottom of the gradient is reached. Most exhilarating! With its automatic Vario system, the Mk IV Gadabout may not be dynamic in what it does, but is relentless throughout its range and delivers everything the rider expects, all day, every day. These machines cost more than your basic run-of-the-mill moped, but the buyer certainly got his money's worth. 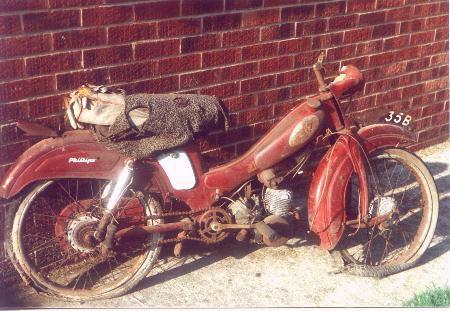 In the twilight of the 1970s the AV89 suffered strangulation from 'Sports Moped' restrictions as its last UK models were handicapped with small porting to comply with the new legislation. The spirit was gone and it just became an overpriced, overweight and underpowered shadow of its former self. The writing was on the wall and the reign was over. Most all versions of the AV89 and Raleigh RM5 are excellent machines provided they've still got all the correct parts and are set-up properly. Avoid the last 'restricted plate' contraptions unless you're willing to accept stunted performance, or prepared to hunt out and fit the right bits to make it go properly. If you want one that's a bit different, the Norman Lido Mk II, Phillips Gadabout Mk IV or any Motobécane Sports Spéciale versions are the best models to go for. Back in 1961 as the ill wind of change blew through the mighty Raleigh group of companies, a sequence of events set about by Norman & Phillips' misfortune was strangely to affect the future of a stunning new creation only just being designed at a small independent manufacturer, miles away at Ascot! A machine so obscure that only one factory released picture ever became published, so very rare that few people even appreciate it was made at all, and only 3 known examples survive of this most unique and exotic of British built mopeds. Such a machine today could only be - Absolutely Fabulous!